Do you love all the flakies?? 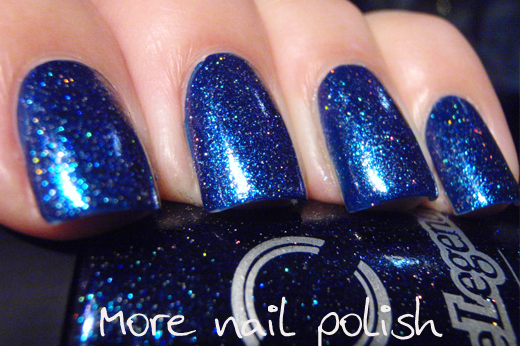 If so, you are going to love this first polish from Dance Legend. 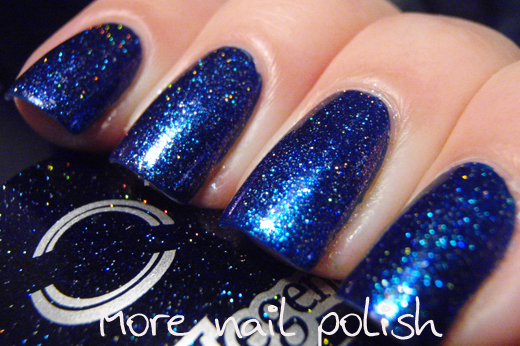 This polish has lots of multicoloured flakies in a clear base. 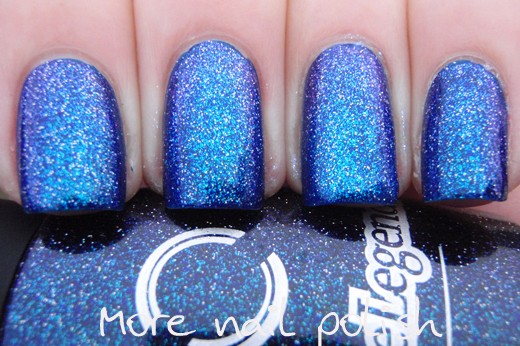 This is Dance Legend Top 603 layered over black. 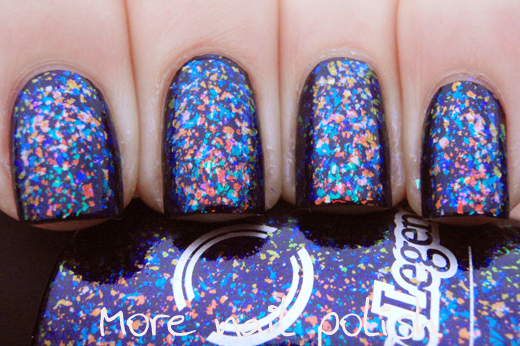 The teal blue looking flakies go from bright green to rich blue, and the orange ones shift from yellow to orange to nearly red. 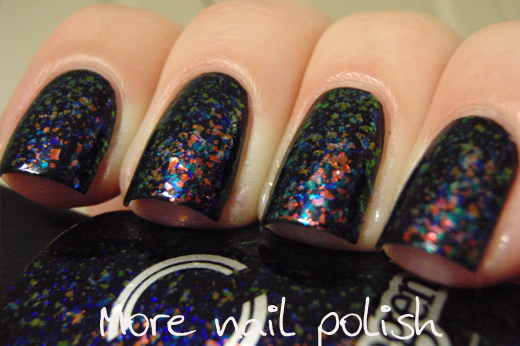 The bottle is so jam packed with the flakies that you will have no troubles getting complete opacity if you wanted. I did two coats cause I wanted flakie overload. This next Dance Legend polish is Dance Legend Top 607. I did two coats layered over Cult Nails Time Traveler. The colour shift in this is so much more predominant than my photos show. 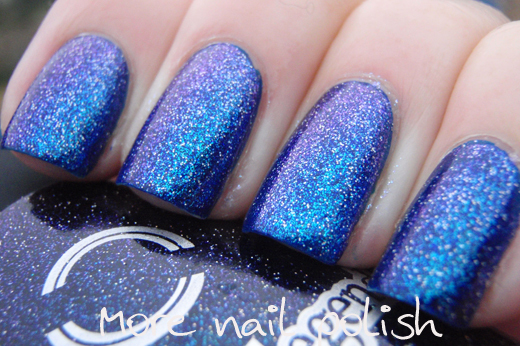 The blue glass fleck shifts to a bright purple, which I totally failed to capture and the silver dots all over the nail are silver holo glitters. 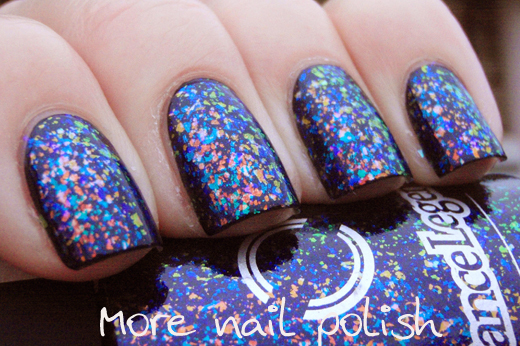 This was one of those polishes where you catch yourself looking at your own nails all the time, admiring how awesome they look. The other thing I love about these polishes is the bottles. The outside of the bottles look like they are actually painted in the actual nail poilsh. I have no idea how they do it, but the bottle with flakies in it, has flakies over black on the outside and it looks exactly like it does on my nails. I love that they did this rather than just putting them in a clear bottle where you see they transparent nature of these layering polishes. 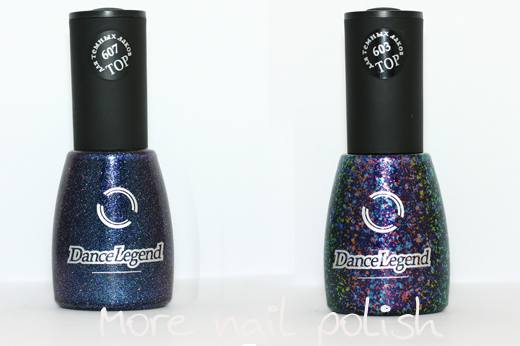 I can't find these polishes on the English version of the Dance Legend website, but I did find them on the Russian version here. 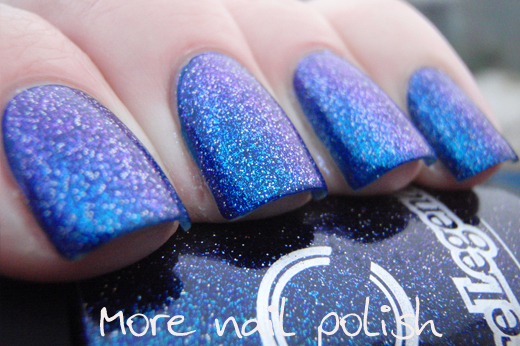 There are eight polishes in the Top coats collection, two flakies and three colour shifting glass flecks with holo glitter. Wow!! They look totally amazing! Just wow. The first one is my favorite. 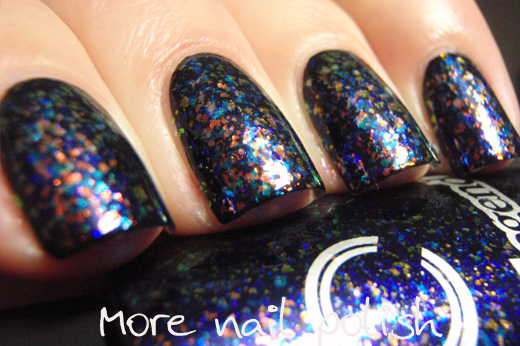 I wonder if 603 is similar to Cult Nails Unicorn Puke, looks delicious. these are so so so pretty!! Ohh, that top one is pretty. I love all your nail polish!!!! Pretty! 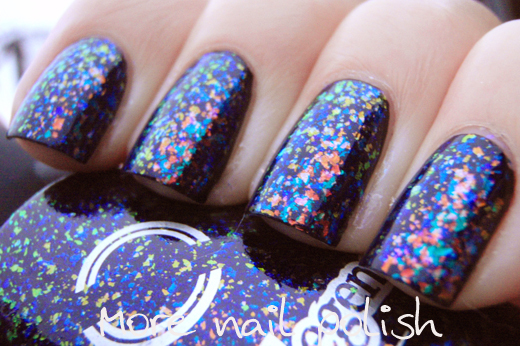 Love the flakies ♥.